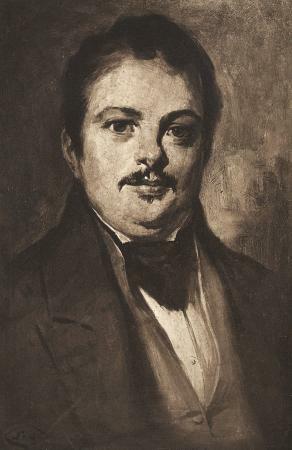 Honoré Balzac was born to an aspiring bourgeois family in Tours, France in 1799. 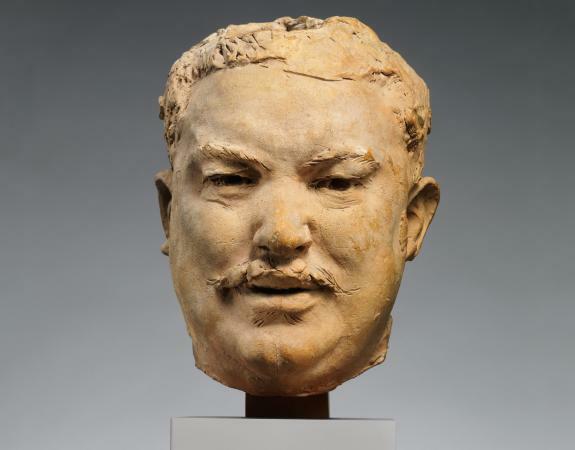 The family later attributed itself an aristocratic particle, making him Honoré de Balzac. The famous writer died in Paris in 1850, having authored over ninety novels and numerous plays, articles, and short stories. Balzac avoided the word "dandy" in his writings. In France in the 1830s and 1840s it had negative connotations of foppishness and English eccentricity. In his Traité de la vie Élégante (Treatise on the Elegant Life) of 1830, he wrote: "In making himself a dandy, a man becomes a piece of boudoir furniture, an extremely ingenious mannequin, who can sit upon a horse or a sofa … but a thinking being … never." Despite his critiques of the dandy's intellect, he greatly admired masculine elegance and British tailoring. One of his most famous literary dandies, Henry de Marsay, epitomizes the sexual appeal and ambiguity of Balzac's version of the dandy. De Marsay was "[…] famous for the passions he inspired, especially remarkable because of his beauty, like that of a young girl, a soft, effeminate beauty, but counterbalanced by his steady, calm, wild and fixed gaze, like that of a tiger: he was loved and he caused fear" (Lost Illusions). Balzac's writings emphasized the contrast between the dandy's leisured cultivation of elegance and the dull soulless drudgery of the workingman's life. His philosophy stands at the cusp between a British model of dandyism as a phenomenon embedded in a specific social context and later nineteenth-century French and British ideas of the decadent dandy. He influenced writers such as Charles Baudelaire and Joris-Karl Huysmans, for whom the dandy was a heroic outsider rebelling against increasing industrialization and social uniformity. Balzac cultivated his personal style and public image. At the end of 1830, he owed his tailor 904 francs, which was more than his entire yearly budget for food and lodging in Paris. As a young, upwardly mobile writer he described his extraordinary dress as a réclame or advertisement and claimed that his cane caused all of Paris to chatter. Indeed, Balzac's accessories seem to have been particularly remarkable: he carried a monstrous cane studded with turquoise, wore coat buttons of elaborately carved gold, and modeled an astonishing variety of waistcoats and gloves. Despite his efforts at elegance, he did not always cut a fine figure and his flamboyant style was not always favorably received. Physically, he was short and squat, and he sacrificed attempts at personal hygiene when deeply involved in his work. Captain Gronow remarked that he wore sparkling jewels on dirty shirtfronts and diamond rings on unwashed fingers. He patronized several famous tailors and these men, along with haberdashers, glovemakers, and other tradesmen, feature prominently in his novels. It is rumored that he had his clothing paid for by advertising certain tailors-including their names, addresses, and eulogies of their products-in his writing. For example, in the novel Lost Illusions (Illusions Perdues, 1837-1843) the young provincial poet Lucien de Rubempré is shamed when he pays cash for an ill-fitting, bright green ready-made suit and wears it to the Paris Opéra. The mature dandy Henry de Marsay insults Lucien, comparing him with a clothed tailor's mannequin. The next day he goes to Staub, who was one of Balzac's own tailors, and spends most of his yearly income on a new outfit. When he returns to his native Angoulême, he turns his new appearance to his advantage. In his skin-tight black trousers he attracts all of the noblewomen of the city. They flock to see him in his new role as a handsome lion or man of fashion. Balzac observes that the styles of the day were best suited to sculptural physiques: "Men still showed off their bodies, to the great despair of the thin or badly-built, and Lucien's form was Apollonian." The Staub suit transforms Lucien's existence in Paris, catapults him to instant notoriety and helps him launch his literary career. This novel celebrates the social power of dress and demeanor. Honoré de Balzac's early journalistic writing pays particular attention to men's fashion. The most important publication related directly to dandyism is the Traité de la vie Élégante (Treatise on the Elegant Life), which was published in Émile de Girardin's royalist review La Mode between 2 October and 6 November 1830. This text fictionalizes the British dandy George Brummell, whom he calls the "patriarch of fashion." Balzac uses him as a mouthpiece to expound his own principles on elegant dress and lifestyle. In the Treatise, he pioneered the concept of vestignomonie (vestignomony), a pun on the pseudoscience of physiognomy. While physiognomists claimed to be able to read human character from facial types and expressions, Balzac affirmed that clothing could be read and deciphered in the same way. Despite the seemingly increasing uniformity of dress in democratic, post-revolutionary France, Balzac claimed that it was easy for the observer to distinguish between men from various social strata and professions. He claimed that clothes revealed the Parisian doctor, aristocrat, or student from the neighborhoods of the Marais, the Faubourg Saint-Germain, the Latin Quarter or the Chaussée d'Antin. While much of Balzac's early work was published in fashionable journals like La Mode, Le Voleur and La Silhouette, his later writings demonstrate a sustained interest in vestimentary style. Dress and clothing play a central role in the ninety-odd volumes of La Comédie Humaine (The Human Comedy) named as a pun on Dante's Divine Comedy. These novels constitute a panorama of French social life from the Revolution (1789) to the end of the July Monarchy (1848). The most important dandy figures in his novels include Eugène de Rastignac, Lucien de Rubempré, Maxime de Trailles, Charles Grandet, Georges Marest, Amédée Soulas, Lousteau, Raphael Valentin and Henry de Marsay. Some of his most important novels were Old Goriot, Eugénie Grandet, Lost Illusions, and Cousin Bette. Balzac's detailed observations and extensive descriptions paint a vivid picture of the nuances of dress in his period and herald the importance given to fashion in realist literature. While Balzac's importance to the study of fashion is taken for granted in French literary criticism, many of his important journalistic texts have not yet been translated into English. Nonetheless, his novels contain some of the most engaging and sophisticated verbal descriptions of fashion in the history of literature. See also Historical Studies of Fashion. Honoré De Balzac. Lost Illusions (Illusions perdues). Translated by Herbert J. Hunt. Harmondsworth, U.K.: Penguin, 1971. --. Traité de la vie Élégante, suivi de théorie de la démarche. Paris: Arléa, 1998. Boucher, François, and Philippe Bruneau. Le vêtement chez Balzac, Paris: extraits de la Comédie humaine l'Institut Français de la Mode, 2001. Fortassier, Rose. Les ecrivains français et la mode. Paris: Puf, 1988. Moers, Ellen. The Dandy: Brummell to Beerbohm. London: Secker and Warburg, 1960.